Daily Oklahoma Cash Grain Prices- as reported by the Oklahoma Dept. of Agriculture on Friday, April 20th. The latest word on the Rhea Fire comes in the form of a video posted on Facebook last night just before midnight- Oklahoma Forestry Services saying that Sunday was another good day of working to shut down the huge Rhea fire- which remains at 288,694 acres- and that the current level of containment is now at 74% done. That was a big jump from the 49% complete that was reported on Saturday. To view the video on Facebook- click here. 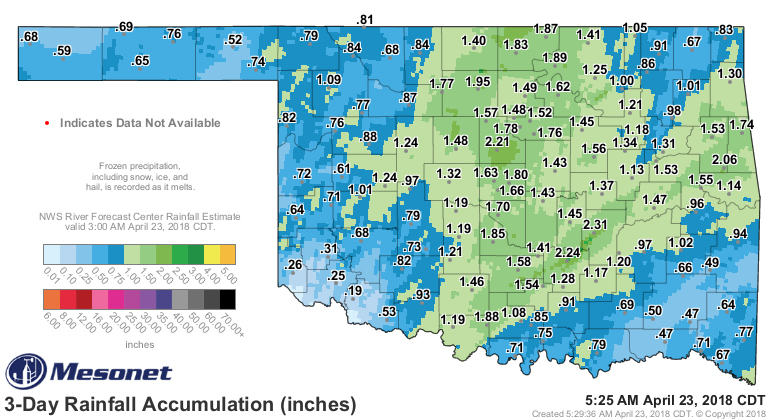 As for the 34 Complex Fire- the report from the Oklahoma Forestry Services webpage remains the most current info- the Woodward County fire has been pretty acurrately mapped at 62,432 acres- and is now at 85% contained. The rains over the weekend helped a great deal- the fire impacted areas got from .77 to an inch of rain- and areas east of there were above the inch level of precip which is a lifeline being thrown out to a really beat up wheat crop- here is the realtime link to the three day total- and the graphic below is the snapshot as of 5:30 AM on this Monday morning. So far, all that's known about the damage caused by the fires in northwest Oklahoma are the acres burned - the latest total calculated with the help of satellite imaging is at about 360,000 acres. Other than that, the only thing known for sure is that more houses have certainly been impacted than what we saw in regard to the fires this time last year. I sat down last week with Michael Kelsey of the Oklahoma Cattlemen's Association who is working alongside his counterparts in the industry to help those affected by these fires in the ag community - preparing for the worst-case scenario that the damage this year is worse than last. "Fearfully, but trying to be realistic, I think the damage numbers are going to be higher," he said. "We know more houses have been affected for sure. We're praying it's not significantly more, but I think we need to be prepared." Click here to hear my full conversation with Kelsey. 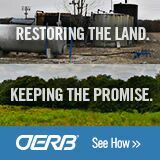 To help producers get a grip on how to begin the recovery process, Kelsey has engaged the OCA's help in organizing two informational meetings that will take place in Woodward, Okla. on Monday April 23rd and Tuesday April 24th, focused on residential loss and assistance programs for agricultural losses, respectively. In the meantime, Kelsey has activated the Oklahoma Cattlemen's Foundation to begin collecting donations to assist our neighbors in the affected areas. Kelsey has a hard time hiding his emotions when talking about the overwhelming charitable response since the fires first sparked. "It's truly amazing what people will do," Kelsey said emotionally. "I think it really tells us what we have in agriculture that's really special." For more information on how you can make a donation in order to help those affected by the fires, or to apply for assistance, click here. The American Pecan Council, according to Scott Landgraf, a pecan grower from southern Oklahoma and founding member, says the Council's early work is starting to pick up steam. I spoke with Landgraf during the APC's last board meeting earlier this month in Texas. He says the future of the pecan industry is, "absolutely glowing." "Yes, it's an exciting time for the pecan industry. It's absolutely a landmark moment," Landgraf said. Having been a part of previous attempts to get a Pecan Council off the ground, Landgraf finds this growing momentum encouraging. In fact, he revealed the Treasurer's report during the meeting indicated that the initial producer investment in the checkoff has actually surpassed expectations - a very positive sign, he thinks, that the industry is supporting this movement. The council's promotional efforts moving forward will be critical in helping the industry catch up to other tree nut competitors who have enjoyed their own national marketing programs for years. "Cattle and calves on feed for the slaughter market in the United States totaled 11.7 million head on April 1, 2018. The inventory was 7 percent above April 1, 2017. This is the second highest April 1 inventory since the series began in 1996. "The inventory included 7.54 million steers and steer calves, up 4 percent from the previous year. This group accounted for 64 percent of the total inventory. Heifers and heifer calves accounted for 4.19 million head, up 14 percent from 2017. "Placements in feedlots during March totaled 1.92 million head, 9 percent below 2017. Net placements were 1.85 million head. "Marketings of fed cattle during March total led 1.84 million head, 4 percent below 2017." To see the complete report from USDA and to hear Dr. Peel's full analysis, click here. 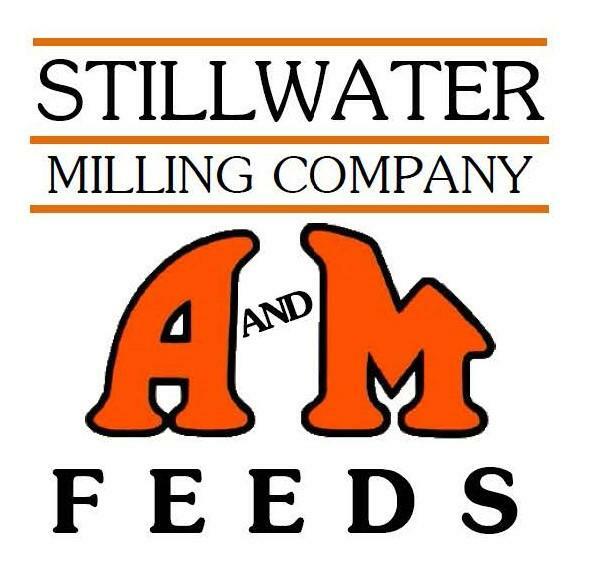 To learn more about the OCA and how you can be a part of this forward-looking group of cattle producers, click here for their website . For more information- call 405-235-4391. Lawmakers have been in session at the State Capitol now almost six months and Michael Kelsey of the Oklahoma Cattlemen's Association says they are getting anxious to get anxious to return home, especially with an election looming later this year. As things start to wind down for this year's session, Kelsey shared with me some of the issues he continues to watch on behalf of our state's producers. The big one he says is a property rights issue that deals specifically with flying drones over private property. This bill would prohibit that, with exception given to law enforcement officials, utility personnel, etc. Kelsey believes that bill will be passed through without issue by next week. Other issues include obviously the state budget, which Kelsey says has finally found some sound bipartisan support, and the legalization of industrial hemp which farmers hope to use as an alternative forage for livestock. Kelsey says movement is expected to be seen on both these issues sometime early this week with little sign the Governor will find opposition to either one. 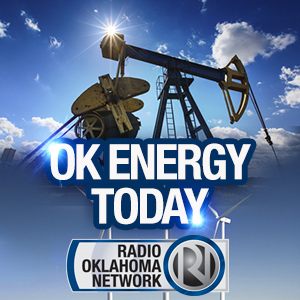 Click or tap here to listen to Kelsey and I discuss these issues and others, including the wind issue in Oklahoma. We finished our coverage of the 2018 Area Stars in Agribusiness this past week with your Northeast Area Star in Agribusiness, Jesse Rader of the Oologah FFA Chapter, who operates a diverse farming operation including beef and dairy cattle, poultry, produce, pecans and bees. Rader is hard-pressed when it comes to picking a favorite part of his business, but says bees are probably one of the most interesting that he is involved with - leasing his hives out to four states across the country. When it comes to running his business, Rader says his secret to success is two-fold. "One is, you've got to spend money to make money," he remarked. "But, time management is also huge. You've got to stay on top of stuff to make sure you keep everything in prime working condition to maximize your profit margins." Rader has aspirations of one day becoming an embryologist and bringing his trade back to northeast Oklahoma. You can hear Rader and I talk more in depth about his impressive and diverse operation, by clicking here for that complete interview. Our salute of the 2018 Area Stars of the Oklahoma FFA is brought to you by American Farmers & Ranchers and AFR Insurance, proud to support Oklahoma's youth. Be sure to check out the Blue-Green Gazette on our website throughout the rest of this week as we continue our coverage of the 2018 FFA Area Stars. A new report by CoBank suggests the influence that mergers of large ag-innovation companies will have on the marketplace will likely begin to reshape the crop protection and seed industry, which will have implications for the overall farm supply sector and force many ag retailers to face future operational changes. "Farm retailers are already facing new competitors and business models that challenge their success and way of doing business," according to Will Secor, CoBank economist. "Meanwhile, their farmer-customers are becoming larger and beginning to come from a new generation-factors that are changing what they need from their local grain and farm supply company." Moving forward, businesses will have to effectively navigate increasingly tight margins within an already stressed farm economy and fierce competition, while at the same time find ways to stay relevant, in order to maintain and gain more efficiency. The major issue will be sorting out the number of options that are available to farm retailers which will all offer their own brand of rebates for the retailer - which can significantly impact a business's bottom line. "The farm supply sector was already responding to changes among its farmer-customers and within its own industry," said Secor. "The mergers' potential influence on rebates, stiff competition and slim margins will accelerate the process. Changes in the seed and crop protection landscape reinforce retailers' pursuit of lower costs and lasting relevance." The full report and a brief video synopsis of it, is available on our website - click or tap here to jump over to our original story to watch. The Texas and Southwestern Cattle Raisers Association announced last week that the organization's current Executive Director of Government and Public Affairs Jason Skaggs, will succeed Eldon White as executive vice president and CEO. White is approaching a planned retirement and in the months ahead will facilitate the transition as executive vice president emeritus. "I cannot praise Eldon enough for the tremendous job he has done as the chief executive for our association," said Bobby McKnight, TSCRA president. "Eldon's leadership has brought about very positive changes to TSCRA and his expertise has been beneficial for cattle raisers not just in Texas, but across the entire country." This transition will take place on Sept. 1, 2018 and continue until White's official retirement on Dec. 31, 2018. White joined TSCRA as executive vice president and CEO in May 2007. Skaggs has served the association in his position for the last decade. "Jason has been an instrumental part of TSCRA over the past 10 years and is absolutely the right choice for the job," said McKnight. "I am confident that his loyalty, dedication and extensive knowledge will help serve our association and the entire cattle industry well." 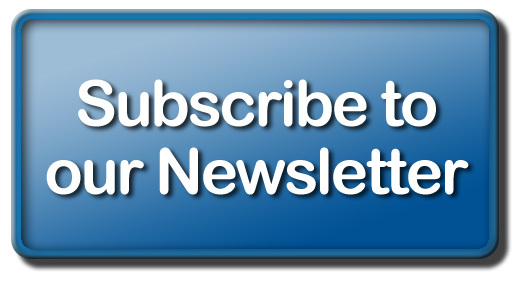 Click or tap here to review the original announcement posted to our website, last week.